In the domain of Pharmaceutical & Fine Chemicals, there is a demand for globalization and the reduction of risks to quality that go with products having advanced functionality, as well as the ability to respond promptly to market needs. TOYO responds to all clients’ requirements, drawing on our comprehensive engineering capacity and the solutions it offers related to the facilities, information and logistic systems required in the domain of medical and fine chemicals. TOYO supports the business expansion of its clients through comprehensive support for clients' advancement overseas (Globalization Support), R&D Engineering for prompt commercialization. TOYO also supports the prompt and reliable market launch of new products. We have also endeavored to offer solutions that result in achieving enhanced product quality and productivity, while responding to the demands of flexible production facilities (prompt response to changes) and the duplication of product lines. Of the alternatives, Multi-Plant is one of the most frequent recommendations made by TOYO. The following tools are used to create the optimum Multi-Plant for our clients. These tools respond to the diverse needs of our clients. Two means of conveyance assembled using the XY Router are available for Multi-Plants handling active pharmaceutical ingredients. They enable the time required for product switching and washing to be shortened, while improving washability and preventing erroneous operation. In this way, we actually enhance productivity, reduce risks to quality and improve the response to changes at plants engaged in high-mix, low-volume production. In the domain of pharmaceuticals and fine chemicals, there is demand for further reductions in the risks to quality due to the sophistication of product functions. Under these circumstances, TOYO offers comprehensive validation support services for the entire lifecycle of the clients’ facilities, backed by technologies related to manufacturing processes and IT, and our accumulated knowledge and experience. In production processes that handle active pharmaceutical ingredients that have a high level of pharmacological activity, there is demand for a technology to contain substances within a system. This page presents our containment technology. Preventing contamination is an important aspect in high-mix, low volume production, especially in medical/pharmaceutical and food products. 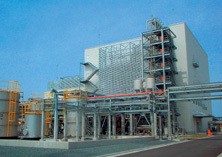 Relying on its unique tool groups and technologies, TOYO recommends and constructs highly productive and flexible batch plants for high-mix low-volume production, variable product types and variable production volumes. This system automatically switches over several lines, offering superior features such as the elimination of cross contamination. The system combines a pigging system and XY Router to significantly enhance the product recovery rate at batch plants that handle viscous materials. TOYO offers comprehensive support in relation to facility and computer validation services, ensuring compliance with the latest regulations and guidelines and coverage for the entire lifecycle of the system, from product development to system configuration, operation and disposal. This is a service for optimizing your production facilities through consultation in a short period of time, based on the quantitative analysis of your production facilities and using a production, logistics and environmental simulators.